Your little 2 month old baby is no doubt just the most adorable little being on the planet….but your 2 month old baby’s sleep may be less darling! By the time your little one is 2 months old, naps may be all over the place, and night sleep may feel like a nightmare. Plus, we find in our work with parents that by the time your baby is 2 months old, all the adrenaline that was keeping you going through the newborn phase is wearing off quickly, and exhaustion is hitting full-force. Yeah…to call 2 months old a tricky time would be an understatement. 😉 Fortunately for you, we have tips! Focus on the first and second naps of the day (the others may be all over the place). Nap schedule? Yeah, right…most 2 month old babies are still napping all over the place, and have little-to-no consistency in their daily feeding and nap schedules. That’s okay – it’s normal. Instead of worrying about making each and every nap a winner, just focus on the first and second naps of the day – those tend to be the most restorative. Make sure those happen at home, and that they are close to an hour. Lots of night-waking is normal. At 2 months old, your baby’s drive to eat still trumps the drive to sleep, and this is perfectly normal. Don’t worry at all about sleeping through the night at this age – just focus on feeding your baby frequently. And take heart – night sleep will gradually start to lengthen in the next month or two. Focus on rhythms and routines, not on the clock. This is HUGE. Most babies are in no way ready for a clock-based schedule at this age, and if you try to force one on your baby, the outcome will no doubt be disastrous (over-tired baby, anyone?). But that doesn’t mean each day needs to be chaotic and unpredictable. What you CAN do is to focus on carving out routines for your 2 month old baby. At this age, the Eat-Play-Sleep routine is a great one – feed your baby, engage her in a short activity, and then lay her down to sleep (ideally, while she’s still slightly awake). And focus on doing this routine in chunks of time, rather than by the clock – for example, aim for 3-hour blocks of time during the day, give or take 30 minutes or so. 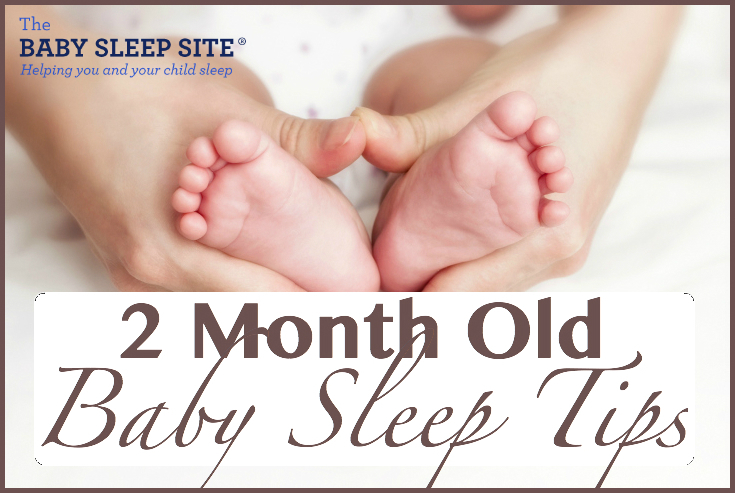 Your 2 month old’s newfound alertness means you need optimal sleep conditions. Gone are the days when you could count on your newborn to sleep anywhere, through anything – your 2 month old baby is much more alert these days! So now, it’s key that you create a great sleep environment – keep the room dim during sleep, use soft white noise to block out ambient sound, try to avoid spending all day out and about so that your baby can catch sleep at home, in his sleep space. The “witching hour” is definitely still ‘a thing’ for your 2 month old! If you find that your 2 month old baby is fussy in the evening, believe me, you are NOT alone – this is so common! Most newborns and young babies go through this “witching hour” fussy spell. It will start to get better soon, but for now, your best bet is to plan on lots of cuddling and feeding in the evening. Remember, this is a development spell…it’s not something to “fix”. And keep in mind, too, that many babies fuss frequently in the evening because they want to cluster feed before they go to bed for the night, so this can actually work to your advantage, if you offer frequent feeds right before bed. Many babies will follow up this spell with their longest stretch of night sleep. You are still in the season of back-to-back-to-back growth spurts, so adjust accordingly. Speaking of fussy spells and cluster-feeding…growth spurt, anyone? Babies go through an eye-popping number of baby growth spurts in the first year of life, and guess what? One of those growth spurts happens right at 8 weeks. You may notice extra night-waking, shortened naps, and increased fussiness around this time – this is all normal. Respond by offering extra feedings as necessary. Just like the “witching hour”, this growth spurt is a perfectly normal developmental stage, and is not a problem to solve; rather, it’s a spell that you just have to wait out. Work now on creating a strong, sleep-inducing bedtime routine. At 2 months old, your baby is still too young for formal sleep training (although you can certainly use our e-Book, Essential Keys to Your Newborn’s Sleep, to work on laying a foundation of healthy sleep habits that will make sleep coaching about a million times easier in another few months!). However, it is NEVER, EVER too early to institute a great bedtime routine! Even though your baby is too young for a fixed bedtime each night, you can definitely start working out a consistent routine now. Then, by the time your baby is ready for sleep training, you’ll already have this foundational step laid. Work on “drowsy, but awake” at bedtime, and/or during the first nap of the day. As I mentioned earlier, your baby is too young for official sleep training at this age. However, if you want to start working on building a healthy foundation of good sleep habits now, you can slowly start to work on laying your baby down drowsy, but awake, a few times each day. You do not want to do this for every nap, and after each night waking (doing that will lead to an overtired and cranky baby! ); rather, just work on drowsy but awake for one nap per day (preferably the first nap, when the drive to sleep is strong) and possibly at bedtime (again, when the drive to sleep is very powerful). Just remember not to push this – if your baby protests, it’s perfectly okay to take a step back, and try again in another week or two. Have sleep or feeding questions about your newborn? Scroll down to ask, to share tips, and to hear from parents just like you! Firstly, thank you so much for all the information on this website!! My 7 week old will nap and wake up after about 45 minute, so I try to put him back to sleep and he ends up sleeping for another 1-2 hours! Should I actually be letting him wake up the first time? He is bottle fed and usually has 3 naps during the day. @Criselda – Thank you for reading and you’re very welcome – we’re glad you’re finding the site helpful! You don’t say how he sleeps at night or from what nap he’s waking from (first, second, etc.). First naps typically can be longer as babies’ drives to sleep are a bit stronger and could be handled differently from other naps during the day. Generally, we let sleeping babies sleep as long as they will so long as they are growing and developing to their healthcare providers’ satisfaction so please let that come into play as you consider continuing to do this in the future. I hope that helps, Criselda. @Joanne – Thank you for reaching out and sharing with us. It’s not always uncommon for babies to go on food “strikes” and refuse food in certain ways due to a variety of reasons (preference, texture, milk flow, situational/environmental, caregiver change, etc.). We’d encourage you to reach out to her healthcare provider who can give you more holistic advice for helping her feed better. Hang in there, Joanne! So my daughter will be 2 Months in the next couple of days. She loves being held when she’s ready for bed. But when the time comes to lay her down, it can be somewhat of a struggle. How do I help her lay down to sleep? These resources should really help start you out on the right foot and begin teaching your baby great sleep habits! We do offer a few more in-depth solutions for parents who need more help too, should you need it. Our e-book, Essential Keys to Your Newborn’s Sleep, may be a good option for you. In it, we give you a complete toolkit to help your baby establish healthy sleep habits today and throughout the first year. I hope this information helps, but please do contact us if you need any assistance! Hi there. My daughter will be exactly 8 weeks old tomorrow (actually today) and has trouble going to sleep early. She is always tired around 11pm which is when I try to get her to sleep but she ALWAYS wakes up after about 45 minutes. (Just as I’m falling asleep myself) Then I spend the next 3 to 5 hours trying to get her back to sleep. She is cleary tired but fights me every step of the way. It’s usually around 4am that she finally goes down for a good 4 or 5 hours. She naps anywhere from 3 to 5 times a day and the naps angel from 20 minutes to 3 hours. I’ve tried everything, dark and quiet room, swaddling, full belly, bedtime routine, burped, changed, massaged, sung to, white noise, in utero sounds, etc I need sleep before 4am. I’m losing my mind. Please help! In addition, our highly trained sleep consultants can help families of newborns manage soothing issues, crying, schedules, sleep associations, and coordinating sleep and feeding times. Our sleep consultation packages are perfect for helping you feel confident in your newborn’s sleep, and we’ll work with you to provide a path forward for understanding when to switch from managing sleep to more formal sleep coaching too. I hope this information really helps, and good luck! My baby is almost two months, and this post was so helpful! I have definitely noticed the witching hour, which is made it challenging to get him to sleep at bedtime. He is doing pretty well at sleeping during the night though, as soon as he’s down. His problem is with naps. If he is drowsy after nursing and diaper change (about 40 min wake time total), I will put him down and he will go to sleep. But the nap will only last up to an hour (usually gas wakes him up), and then he’s up again and expects to nurse, since we’re trying to follow the eat play sleep routine. If I wait longer than around 40 minutes to put him down, he then gets too awake and will not sleep for a loooong time. But the alternative is having him awake and nursing every hour and a half, which is way too close often and leads to snacking since he’s not getting as hungry as he should between feedings. I’m wondering if he just doesn’t nap well during the day because he sleeps so well at night? Because he will sleep through gas at night, but not during the day. And the past few days he’s only been napping twice or three times between his wake time and bedtime. I feel like for an 8 week old this is not quite enough sleep, and he definitely gets overtired and fussy after being awake for 3 hours. Any ideas? Thanks!! I hope this helps! Let us know if you have any more questions! Hi. I have a 8 week old who seems to do ok with getting less sleep than I know is recommendEd at this age. His night schedule is basically from 11pm to 8am. He wakes once around 4am to feed. After he wakes at 8am I change his diaper n take his brother to school. Some days he falls asleep in the car etc. But I can’t get him to fall back asleep once home. It seems that if his first nap isn’t a success all other day naps aren’t as well. He can go hours awake and be 100% happy about it. Should I be more rigid at home about his naps and if so how do I go about doing it with my 3 year old and his schedule. Examples, today up at 8am. Back at home at 845 (Fell asleep in car. ). I nused him to sleep at 9 and he slept until 1015 where we did errands until 1130 when we had to pick up big brother. He was obviously tired then but I tried my best to get home quickly so I could put him down… no success. So we just played until it was 1pm. He went down for an hour then woke up. I changed him and nursed him back to sleep where he slept from 245 until 415. And from there it’s tiny cat naps in swings until bed. Is he getting enough sleep?? And if he’s happy does that mean everything’s ok?? I hope this helps and things improve quickly! Thank you, Danielle, for steering me to that article; I did find it helpful. I do have a question though…my 2 month old will not fall asleep by himself – he has to be held and normally rocked or bounced, and he seems to prefer when I do this, not my husband. I am a stay at home mom and so I am with him 24/7 so I guess it makes sense. This is mostly a problem during the day for naps, he sleeps in his bassinet during the night. Anyway my question is do you have any tips for how I might help my son learn to nap while he is not being held? He is VERY sensitive to getting overtired and so it has been challenging to figure out a way to try to teach him to sleep outside of my arms and yet still get him the sleep that he needs to not be overly tired when night time comes (which makes bedtime much harder). Any tips are greatly appreciated! If you need any more help, just let us know! We have a variety of resources so feel free to contact us directly any time at contact@babysleepsite.com and we can send you more information. Hope this helps! Hi there! I am curious when I will know it is the right time to start sleep training my baby (by sleep training I mean nap training really…he does pretty well during the night so I am not too worried about that right now). He is currently 2 months old. I know most people recommend waiting until 3 or 4 months or even older. I am just wondering why I cannot sleep train my baby now at 2 months and what developmental signs I can be looking for so I know when to start. My son is on a very consistent feeding schedule (he was in the NICU for two weeks after birth and they put him on a rigid feeding schedule and that has kind of stuck with him I guess). Because he is very consistent with his feeds could it possibly work to nap train him now. I have been trying to put him down for naps and bedtime drowsy but awake and it rarely works. He then gets overly tired and fights sleep really hard. I then need to rock him or give him a pacifier or or hold him in order to get him to go to sleep and stay asleep. I don’t want to keep feeding bad habits and creating sleep props, but I also don’t want to exasperate both him and me trying to sleep train if he isn’t ready yet. So how will I know when it is the right time? Thanks so much! Your site has been so helpful in helping me understand baby sleep better. I hope it helps, but if you still have any questions, please do write another comment! We’d love to help. Good luck! I’m very excited to find this site. Thanks for all your tips! I have a 9 weeks old baby boy who got into the habit of feeding before going into sleep. I have to breastfeed him for each naps and for the night time. The issue is that he really needs to burp after feeding and if I burp him he wakes up and I need to feed him a bit more. Sometimes this can take for one hour. If I don’t burp him, he wakes up 15 min later and won’t go back to sleep. I am wondering how I can break this habit. Good luck and hope to “see” you here again! Hi, I have a 9 week old and he was sleeping wonderfully around 7 weeks. He has now been waking up every hour to two hours. It seems Gas and hunger are the two driving forces of this wakefulness. He is breastfed and nothing in my diet has changed since his birth. I don’t eat dairy or gas-inducing veggies. We recently have stopped swaddling due to the baby’s ability to pull his hands up and roll onto his side. Could this be contributing to his lack of sleep? We have been alternating between the Zipadee Zip and Baby Merlin’s Magic Sleepsuit. Are there any tips to help him sleep longer? Thanks! In addition, our highly trained sleep consultants can help families of newborns too. I hope this information helps, and that sleep improves very soon! Hi! I have a 3 month old girl who has much difficulty going to sleep at night. But once she goes to sleep she’ll sleep at a stretch of maybe 5-6 hours. The thing is recently things have gotten much worse. She’ll only sleep around 2 or maybe even 3 in the morning. What should I do to get her to sleep earlier? @Mia – Thank you for stopping by our sleepy little village and for reading. Sleep generally starts to shift (and worsen!) for babies around 3/4 months old, so we know exactly where you’re coming from! There are so many considerations and suggestions that we could make for you as there are numerous gentle ways to help her start to sleep better for you, but we’d need more detailed information from you about your little girl, her temperament, day-to-day “schedule,” etc before we’re able to do a good job of it. Please consider connecting with one of our baby sleep experts who can walk you through helping your daughter sleep better step-by-step – http://www.babysleepsite.com/about Hang in there, Mia! I am so happy I found this page, thanks for all the information. My olmost 10 weeks old baby boy only has 2 or 3 naps during the day that usually last 30 to 45 minutes and at nights he wakes up every 2 hours or so. We noticed that since he got his 2 moth shots he decreased the amount of formula he eats. Is there any way I can make him start sleeping longer periods at night? I hope these resources help! Thanks for stopping by the Baby Sleep Site. Thank you for visiting our sleepy little village! 8 weeks is definitely not too late to start a new routine. You might enjoy our article on the eat play sleep routine here: https://www.babysleepsite.com/sleep-training/babywise-eat-play-sleep-schedule/ Good luck! My son is 8weeks +1day. He will not sleep anywhere but on somebody. Did not sleep in a Moses basket, would cry when put down awake, asleep or drowsy. We have now purchased a next to me crib and he still will not sleep in it. I tried swaddling but he just kicked. I also tried white noise. Hang in there, Gemma and please keep reading!